Despite the weather of late, I have been looking into summer activities for the kids. there is no shortage to choose from, either through the City of Ottawa or local churches and organizations. This year we chose two from the City and one called "Camp Awesome" through one of our local churches. I hear it's "awesome" hee hee. This is all well and good, but summer can be LOOOONG for a mom of two demanding active children. Last year I came up with a way to make summer both fun for my lovelies as well as easy for me to get things done without being "ON" 24/7. Summer camp at home!! 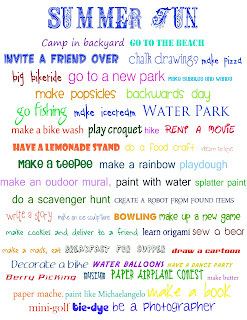 We did as all good camps would do, we planned out each weeks activities from crafts to excursions. We came up with a fancy camp name "Wannahaha" Then we made a flag and a sign which we hung outside the house. We made up camp rules and chores for cleaning up. Then we made a camp shirt. That took care of the first week. There were also door labels to put up in the house. The kids thought is was awesome. I made three jars with labels. Each morning the children had to pick an activity from each jar. They were labeled "Chore", "Craft/Science" and "Extra". The kids had to do the chore first and then we could go onto the other activities. The "Extra" category is a mixture of things that everyone wanted to do. ie: trip (great for touring the city), cooking, outdoor activity (sprinkler), movie etc... If the children chose to do more than one chore, they could earn an extra activity a week - although this year I will make a BONUS jar instead. It will have big things in it. For example - go to a movie, the beach or a big cost item. For the most part, I tried to keep the activities close to home (or AT home more like) and on the lowest cost side as possible. it may sound like a daunting task, but in fact we had way more activities to do than we had time. Here is the list we used last here. I have also since found new sites that have low or no cost activities at home than can be used. Like this one. I almost think this is more fun than going to a camp for younger children since it is tailor made for your individual children and they get to program all their own activities. 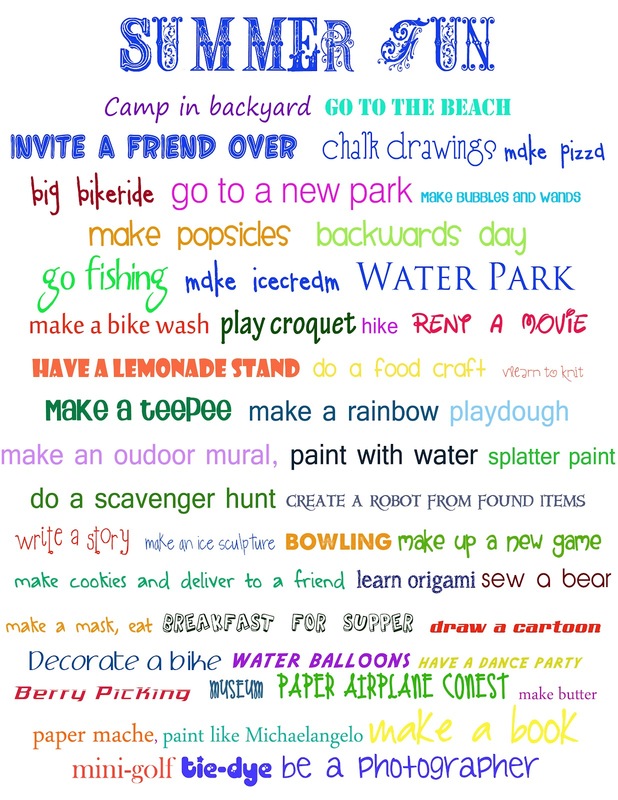 With summer fast approaching, what are some ways you're planning to keep your children entertained?